Thank you for your interest in the Best Western Victorian Inn. We just finished a complete guest room bath renovation for your enjoyment! Explore the Monterey Bay Aquarium and the unique shops and restaurants along Cannery Row, all within walking distance of our intimate hotel. Relax in one of our spacious Monterey hotel rooms, which features a marble fireplace, 42-inch flat screen TV, free Wi-Fi and one king or two double beds. Complimentary Monterey County wine and a selection of cheeses are served in the parlor every afternoon. Enjoy the fresh coastal air from your private patio, balcony or window seat overlooking Cannery Row or our lovely garden courtyards. The Monterey Bay Aquarium and Cannery Row's shopping and dining are just a few short blocks away from our pet friendly hotel. The Best Western Plus Victorian Inn is Green Seal Silver Certified and a proud sponsor of the Monterey Jazz Festival. Enjoy stunning coastal scenery when you head out on a drive around the 17 mile drive through Pebble Beach or head down Highway 1 for beautiful Pacific Ocean panoramic view points. The Mazda Raceway Laguna Seca is a popular nearby attraction featuring the Red Bull U.S. Grand Prix and other exciting motorsport events. If you want something a little more cultural, the Lobby and Parlor in a 1906 original Victorian house is the perfect romantic destination. If little ones are in tow, a trip to the Monterey Fairgrounds is a must. This Monterey hotel is close to everything, so get ready for a fantastic trip. 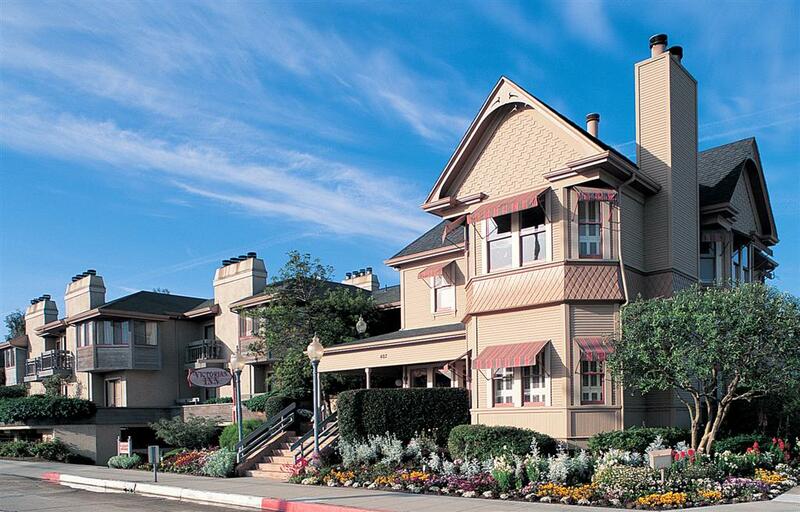 Our Monterey hotel prides itself on friendly service, quality amenities and a great Cannery Row location. Near the beach with family suites, it's an easy choice. Looking for hotels with a fireplace in Monterey? You got it. Evenings can get a little chilly and it's always a good excuse to snuggle up to someone special. Reserve your getaway with Best Western Victorian Inn for a stress-free escape! Fish Hopper: 0.31 mile(s) from Fish Hopper, bar/lounge, Seafood, open for: lunch, dinner, Seafood & Steaks. First Awakenings: 0.51 mile(s) from First Awakenings, bar/lounge, American, open for: breakfast, lunch, Breakfast & lunch offerings. Paradiso Trattoria: 0.26 mile(s) from Paradiso Trattoria, bar/lounge, Mediterranean, open for: lunch, dinner, California-Mediterrean cuisine. Bistro Moulin: 0.39 mile(s) from Bistro Moulin, bar/lounge, French, open for: dinner, European Cuisine. Domenico's on the Wharf: 1.48 mile(s) from Domenico's on the Wharf, bar/lounge, Seafood, open for: lunch, dinner, Fresh seafood & Italian cuisine. Chart House: 0.22 mile(s) from Chart House, bar/lounge, American, open for: dinner, Spectacular waterfront dining. Whaling Station: 0.30 mile(s) from Whaling Station, bar/lounge, Steak House, open for: dinner, Monterey County's No.1 Steak House for over 40 years. From: The north. From Highway 1, take the Del Monte Avenue/Pacific Grove Exit, Exit 402B and merge onto Del Monte Avenue. Follow the signs to the Monterey Bay Aquarium. Turn right onto Foam Street and follow to McClellan Street. The Best Western Plus Victorian Inn is on left side of Foam Street. From: The south. From Highway 1, take the Del Monte Avenue/Pacific Grove Exit, Exit 402B and turn left onto Del Monte Avenue. Follow the signs to the Monterey Bay Aquarium. Turn right onto Foam Street and follow to McClellan Street. The Best Western Plus Victorian Inn is on left side of Foam Street.